To clarify, stem cell research on embryos is not illegal in the US and Bush has not tought to make it illegal. Bush's stance is that it remain legal but not be funded with federal tax dollars, because many people (like Catholics) believe it to be a sin to capitalize on embryonic fetal tissue. The whole matter is not a question of politics, nor science - it's a question of money. Harvard University for example does stem cell research. That school is sitting on an endowment of some $25 billion. They could use their vast financial resources to do stem cell studies, but no, they want more federal largesse. The Wright brothers did not need federal help to build their airplane. There's gobs of money sitting in private charities and private companies that can go to stem cell research. More than enough without mixing in tax dollars and forcing some people to subsidize something they believe to be a grievous sin. Please excuse my ignorance, but what is done with the embryos after the stem lines are created? Are they just refrozen and placed back in the bank? I do find it interesting the stem cell research on embryos has produced little if any advances and reports are that cancer like growths have been experienced because the cells can not be controlled; where as adult stem cell research has produced results. Ignoring any political aspects of this issue, the money should go where the breakthroughs are being made. Unfortunately, politics does enter into this equation and for some reason those that support embryonic stem cell research just can’t let go. As is what too often happens, those that have invested their creditability in one side or the other of an issue can not follow the evidence and facts to a logical conclusion. A sorry waste of resources and public and private funds is the result. It is simply not correct to say that thus procedure is harmless. The cell extraction procedure is known from IVF work to render some percentage of embryos nonviable, though it does seem that embryos that do survive the procedure suffer no ill effect. The clinging to embryonic research is partly from researchers who are heavily invested in it (years milking grant lines) not wanting to have to start over. But, still, working with the person's own stem cells is clearly much more ideal from the standpoint of rejection, at least as long as the genes responsible for the problem in the first place aren't a deal killer. However, I think the line is being held so firmly on embryonic stem cells from other quarters because it is very close cousin to the abortion issue. The unrestricted abortion crowd probably sees it as another rampart to defend. FWIW I don't think the embryonic and adult research are far enough along to definitively say embryonic work is no longer needed, period. But that is a far cry from not allowing restrictions on it in the meantime. To be clear, this procedure is no MORE harmful to embryos than the equivalent procedure used for genetic testing in IVF. But the Bush standard us actually tougher than the standards applied to IVF. Inconsistent? Perhaps, but at least with IVF objecting taxpayers are not footing the bill. sorry, us --> is in both posts. Damn iPhone! Bush duped the religious right big time -- he ensured that embryonic stem-cell research would remain legal -- but the press played into his hands by implying he made it illegal simply by refusing to use federal funds. I suppose I'm on the religious right, so what duping do you mean? I read Bush's original statement when he issued its quite clear and understandable. What the media and BDS crowd did was create and repeat untruths, or at a minimum, exaggerations and misimpressions. If it comes back to haunt them, so be it. If you accept the premise that it is wrong to use an embryo as a means to an end, such as research or development -- as opposed to allowing an embryo to develop naturally -- then this is still unacceptable. If the embryonic human being has rights, it has the right not to be used in this fashion; that the embryo isn't "destroyed" is not the line. my question re: embryonic stem cells is a simple one. How do we know the embryo is normal - normal chromosome complement and not harboring a sleeper gene to awaken years in the future to wreak havoc with potential recipients? Bush's instincts, though possibly misguided, may have been right all along. Be afraid ... be very afraid. Doc99, I think your question reflects a misunderstanding of stem cell research. It's not like the genetic information from a single embryo is somehow going to be placed inside millions of people. Ultimately, a successful embryonic stem cell treatment will require that the source embryo be a good genetic match for the patient. Indeed, one of the ethical concerns here is that the best choice would be to clone the patient and use genetically identical embryo to harvest stem cells. Besides, what genetic abnormalities would you be thinking of? And why wouldn't they appear in embryos that ultimately develop into walking talking human beings? Embryos used in stem cell research are no different. (Indeed, that is the point to those opposed to ESC research; embryos are people!) In fact, embryos used in research purposes can undergo far more genetic screening than babies receive in the womb, exactly because they are considered more dispensible. It seems a bit naive to suggest that stem cell research is "A sorry waste of resources and public and private funds". Breakthroughs in research come with time and work (and thus require funding). 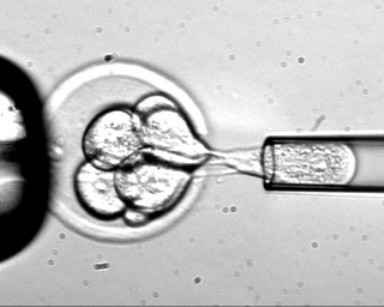 The scientific and medical potential offered by stem cell research cannot be ignored, and any progress obtained which would preserve the viability of a precious embryo should be accredited and given a change to further any obtainable advancements (for those opposed to stem cell research this could be concidered a compromise). Well, we can all sleep easy tonight knowing that the surplus embryos will not be harmed in any way, before they are destroyed. To bad our president didn't follow the old saw, "Its better to be silent and allow others to think you a fool, than to open your mouth and prove them right." i think it somewhat silly that the gov't denies funding because of a religious interpretation of the science. people say their tax money shouldn't be used to support research they think is morally wrong. my tax money (and that of many others) is used to support things i morally object to. why should the objects of a "christian" be worth more than mine? these embryos most likely will never be used to produce a child. using them to further understanding of medical problems seems a far less ethical issue than just tossing them in the trashcan. As others have stated above, the embryos will be destroyed anyway. So, we must give them a good death? Like sam said, they have no nervous system, and therefore, no feelings. If anything with a unique genetic code really had a sole, then murder is already being committed! And what about the many embryos that are created inside of women that don't survive due to imperfections in their reproductive organs? Should we start to obsess about them too? This is an issue that we must confront religious persons on. The secular world must heard on matters of superstition. I hope this is not a discussion of sentiments its science and technology, If the embryos are 'Safe' then its a great approach. Are we clear that they are perfect after the extrusion! Hello excellent information but If the embryonic human being has rights, it has the right not to be used in this fashion; that the embryo isn't "destroyed" is not the line. The cell extraction procedure is known from IVF work to render some percentage of embryos nonviable, though it does seem that embryos that do survive the procedure suffer no ill effect. cool site, very nice information congratulations!! Once I read a book that spoke and explained the functioning of stem cells in our body.